As part of our What The Hell Happened Project, Data for Progress commissioned a survey of 3,215 voters from YouGov Blue that was fielded October 27th through November 7th, which was weighted to be nationally representative of 2018 voters. The sample was weighted using estimates of the electorate from Catalist, a voter file firm with a lengthy track record of success. We’ve shared this dataset with leading academics and practitioners and will be publishing the results of their analysis as well as our own. Our first analysis comes from Brian Schaffner (@b_schaffner), Newhouse Professor of Civic Studies at Tisch College and the Department of Political Science at Tufts University and one of the country’s leading experts in survey research. Immediately after the 2016 election, I documented the strong role that both racial attitudes and sexism played in predicting who voted for Trump, even after controlling for a myriad of other factors. This was based on research with my colleagues Tatishe Nteta and Matthew MacWilliams and is a finding that has been reinforced by many other studies published since then (more than I could possibly link to here). But, of course, racial attitudes were hardly a newly divisive factor in 2016; such attitudes have long been associated with the partisan divide in the United States and became even more pronounced throughout Obama’s presidency. Trump’s campaign simply served to further sharpen this division. While racism dominated our politics long before Trump, Trump’s campaign rhetoric frequently targeted women in a much more explicit and offensive manner than previous Republican presidential candidates. The final month of the 2016 campaign was focused intently on the Access Hollywood tape and Trump’s “nasty woman” remark during a debate, and in a striking parallel, the final month of the 2018 campaign was defined by the divisive debate over the Kavanaugh confirmation in the wake of sexual assault allegations. In fact, I have shown that Republicans responded to Trump’s sexist campaign in 2016 by becoming more willing to endorse sexist statements after the election. But my analysis of the Data for Progress election survey compared to the 2016 Cooperative Congressional Election Study shows that the hostile rhetoric toward women by Trump and Republican members of Congress is beginning to take their toll on the party’s electoral fortunes. In 2018, Republican House candidates were penalized by voters who don’t hold sexist views in a way they were not in 2016. And this rhetoric does not appear to be winning the party any new supporters to make up for those losses. The first graph shows the relationship between racial attitudes and voting for Trump and for Republican House candidates in 2016. 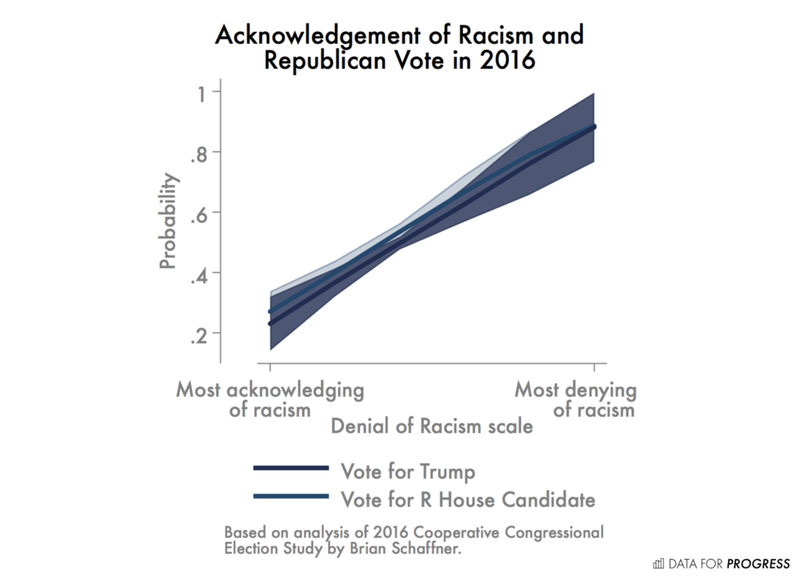 The key thing to note here is that the lines track very closely together; even controlling for partisanship and ideology, the extent to which a voter acknowledged or denied the presence of racism in the United States was a very strong predictor of voting not only for Trump, but also for Republican House candidates. The second chart shows something a bit different when we look at the relationship between hostile sexism and vote choice in 2016. Namely, hostile sexism had a somewhat unique effect on support for Trump, one that did not really exist for Republican House candidates in that election. Specifically, controlling for partisanship, ideology, and racial attitudes, voters with the most sexist attitudes were more than 15 points more likely to vote for Trump than those with the least sexist attitudes. By comparison, moving from having the least to the most sexist attitudes produced just a 5-point increase in support for the Republican House candidate. Indeed, hostile sexism was not a statistically significant predictor of vote choice in House races in 2016, after controlling for the other factors in the model. So how does this compare to the House vote in 2018? The next chart uses the same approach to compare the relationship between racial attitudes and House vote choice in the 2016 election to what it was in the 2018 election. Here, we see that there is remarkable consistency in how racial attitudes are related to the House vote across the two elections. Specifically, the increasing denial of racism had roughly the same effect on the probability of voting for the Republican House candidate in both elections; the only thing that changed is that the baseline support for Republicans dropped in 2018. In the final graphic, we can see one reason why that support dropped in 2018. 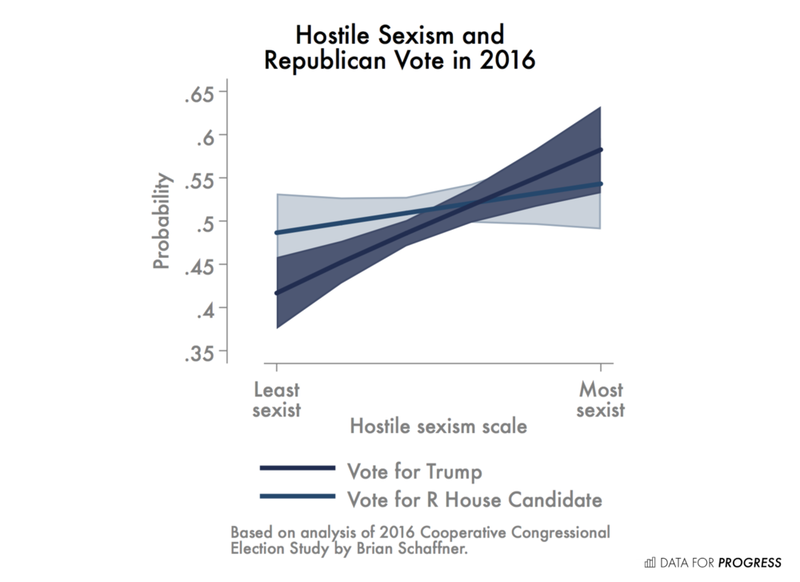 Unlike in 2016, the House vote in 2018 was strongly associated with attitudes on sexism. Specifically, in 2018, voters with the least sexist attitudes were about 15 points less likely to vote for the Republican House candidate compared to voters with the most sexist attitudes. And based on the graphic, this appears to have produced a penalty for Republican House candidates. Only among the most sexist voters do we find similar support for Republican House candidates as we did in 2016. As voters became more likely to reject sexist statements, they became significantly less likely to vote for the Republican in 2018 relative to the 2016 levels of support among voters with those same views on sexism. Thus, the data here suggest that after two years as president, Trump’s sexism has begun to become part of the Republican Party’s branding for GOP House candidates. As such, in 2018 it became yet another identity-based line of division between Republican and Democratic voters. But, importantly, it also appears to be a branding problem for the Republican Party. Specifically, the evidence here suggests that Republican House candidates did not gain votes among sexist voters, but they lost support among those with less sexist attitudes. This is a pattern that helps to explain the dramatic increase in Democratic voting among college-educated women in 2018. It’s a natural reaction not only to how Republican lawmakers have increasingly embraced Trump’s sexist rhetoric since 2016 (most notably on display during the divisive debate over the confirmation of Brett Kavanaugh), but also due to the successful mobilization of women’s rights groups during the past two years. As a result, Republicans appear to have paid a price for their party’s sexism in 2018 and the consequences for them may persist well beyond this election. Brian F. Schaffner (@b_schaffner) is the Newhouse Professor of Civic Studies at Tisch College and the Department of Political Science at Tufts University.